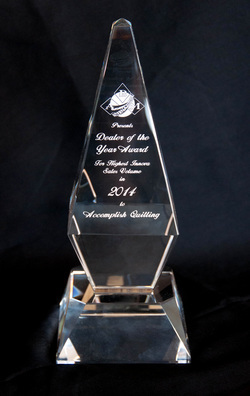 We were Dealer of the Year in 2014. We are dealer of the year again in 2015! To most, they would stick out their chest and think that they were at the top of the heap. For us at Accomplish Quilting, we AGAIN are proud to win the Dealer of the Year award from ABM but that is not all that it meant to us. For us it means that we did our jobs right. It means that we did what our customers expected of us. It also means that we can't rest on our laurels and think we have achieved. It means that even though we rose to the top, there is still room for improvement. That is exactly what we are doing. Each and every day at Accomplish Quilting, our team comes together to comunitcate with each other to fulfill our duties as we move through our day. We actively work throughout the week to plan and implement changes that, as a team, we have laid out the week before. Every Tuesday morning the entire team gathers around the conference table and we go through the past week and update what has transpired, talk about new challenges, set new goals for achievement, identify and implement new programs to bring more service to the customer and lay out the week for the entire team. The next Monday morning that exact thing takes place again! So we thank you, our customers, for believing in us. We thank you for giving us your business. We thank you, for not only being our customers, but our friends as well. ​It is our goal in 2018 to serve you even better!